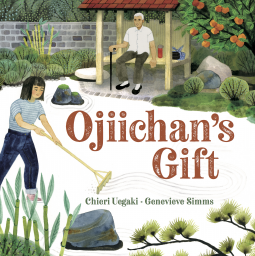 Love between generations: Ojiichan’s Gift – Joyce's mystery and fiction book reviews with some non-fiction too! This is a lovely, elegaic story about the love between a young girl and her grandfather. The illustrations complement the story beautifully. Mayumi visits her grandfather in Japan every summer. The two share a love for the rock garden that the grandfather has created. Each year, Mayumi can do more in the garden. The two enjoy working together and then sitting on a bench to share their bento box. One summer Mayumi’s grandfather has grown older and can no longer care for his garden. What does Mayumi do for him? How does she create a memory for herself? These two questions are answered in this lovely story about the connection between the grandparent/grandchild generation. This sweet story will be a good resource for children whose relatives are aging. Thanks to NetGalley and the publisher for this advance copy which I have received in exchange for an honest review. ← Learning to Share: Mine. Yours.